Despite constant improvements in dental care, millions of Americans still suffer from tooth loss. It could be due to decay, periodontal disease, injury, or any other number of factors. In the past, the only treatments available were bridges and dentures, but now — at Mid Wilshire Dentistry — you can opt for a dental implant as well. Dental implants are metal posts that are inserted into the jaw and gum line to replace your tooth root and act as a support to mount your replacement tooth. Since implants are fused to your jawbone, they give you stable support for artificial teeth. Any dentures, bridges, or replacement teeth mounted to implants won’t shift or slip in your mouth, which is particularly important when speaking and eating. This more secure fit lets dentures, bridges, and replacement teeth feel more natural in your mouth than after a conventional bridge or denture procedure. For many, bridges and dentures aren’t possible. For some, sore spots, poor ridges, and gagging can make ordinary bridges and dentures impossible or uncomfortable. Additionally, while bridges must be attached to teeth on both sides of the missing tooth gap, implants do not require any adjacent teeth to be ground down or prepped to hold your new replacement tooth/teeth in place. Endosteal Implants: These implants are surgically implanted into the jawbone, and once the gum tissue around these implants has healed, a second surgery is needed to connect a post to this original implant. Afterwards, an artificial tooth (or teeth) is connected to the post either individually or in a group on a bridge or denture. Subperiosteal implants: These implants have a metal frame that is fitted below the gums onto the jawbone. As your gums heal, the frame fixes to the jawbone, and posts, which are attached to this frame, stick through the gums. Just like with endosteal implants, your artificial teeth are then mounted on the posts. 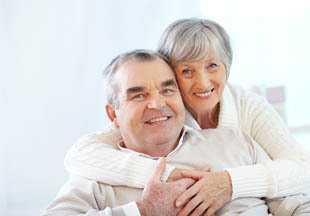 Dental implants are a great way to replace a missing tooth in a way that is both sturdy and permanent. If you’d like more information, contact us at Mid Wilshire Dentistry at 213-550-2357 and schedule an appointment today.